Hopefully all of you can get YOUR official entry in for the 700th comic! This isn’t a normal comic! ^_^ There is no background colour for Sunday! What I think she’s getting at is that without a sunday comic strip 700 was due to happen on thursday- and now it’ll happen on a Wednesday instead. And there may even be another comic today, meaning comic 700 will happen on a Tuesday. Ah I knew I should have made copies and done each background on then! XD j/k. It’s a miracle I got through that one comic, let alone five. Though I could have done more scenes then lol. 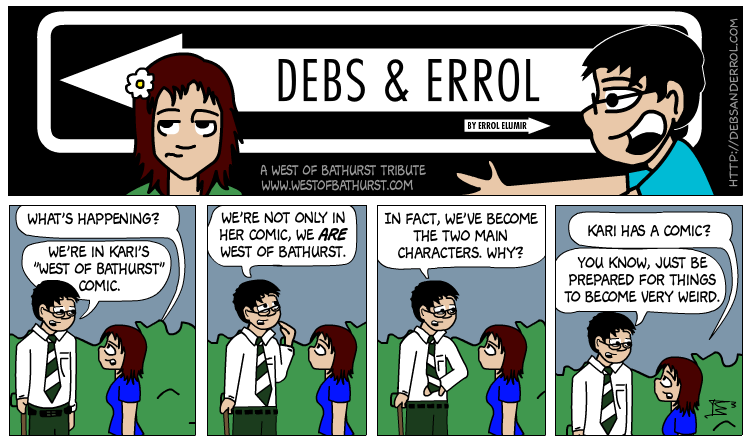 Also, with regards to comic 700- and my submission for it, I am currently erasing Errol from existence… perhaps I’m overreacting? I need to start drawing my comic already! It’s probably going to end up being one panel. I would say Errol knows how I feel now re. drawing by hand, but he is still cutting and pasting quite liberally, plus using font for the dialogue. I think he would go mad and run away screaming if he did comics my way. Well I won’t be making the podcast tonight. My modem is completely shot now, though it had been working earlier this morning. It won’t even cycle reset itself anymore. Ugh. Awww… man, you guys are having crazy internet issues. I’m glad you were able to join us for the gift opening then!! Ew, I’m sorry, you will be missed.